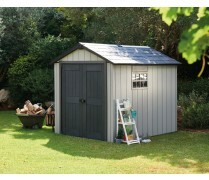 Choosing a shed is made easy with Keter's extensive range of plastic outdoor sheds. Vertical and horizontal-shaped sheds can easily slot between or underneath other items, if necessary. All Keter's plastic sheds come in attractive neutral colors, and the rattan-style line offers you an additional sense of style for your outdoor.